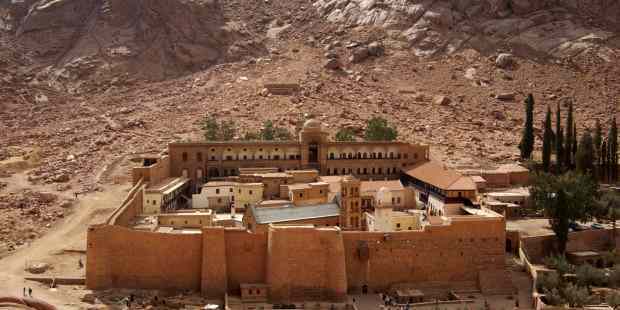 According to the Christian monks of Saint Catherine’s Monastery in Mount Sinai Egypt, prophet Muhammad pbuh granted their community protections and other privileges in a letter issued around 625 CE or 630 CE. Early Muslim scholars who attested to the authenticity of this covenant include Muhammad ibn Sa’d al-Baghdadi (784-845) and Ismail ibn Kathir (1301–1373). Historical records show that the covenant was honored by the Caliphs Abu Bakr, Umar, Uthman, and Ali, as well as the Umayyads, and the Abassids. The covenant is also referenced in political decrees by the Fatimids (901-1171), Ayyubids (1174-1249), Mamluks (1250-1517) and the Ottomans. This letter contains the oath given unto them, and he who disobeys that which is therein will be considered a disbeliever and a transgressor to that whereunto he is commanded. He will be regarded as one who has corrupted the oath of God, disbelieved His Testament, rejected His Authority, despised His Religion, and made himself deserving of His Curse, whether he is a Sultan or any other believer of Islam. Whenever Christian monks, devotees and pilgrims gather together, whether in a mountain or valley, or den, or frequented place, or plain, or church, or in houses of worship, verily we are with them and shall protect them, and their properties and their morals, by Myself, by My Friends and by My Assistants, for they are of My Subjects and under My Protection. I shall exempt them from that which may disturb them; of the burdens which are paid by others as an oath of allegiance. They must not give anything of their income but that which pleases them, they must not be offended, or disturbed, or coerced or compelled. Their judges should not be changed or prevented from accomplishing their offices, nor the monks disturbed in exercising their religious order, or the people of seclusion be stopped from dwelling in their cells. They shall not be imposed upon by anyone to undertake a journey, or to be forced to go to wars or to carry arms; for the Muslims have to fight for them. Do no dispute or argue with them, but deal according to the verse recorded in the Quran: “Do not dispute or argue with the People of the Book but in that which is best” 29:46. Thus they will live favored and protected from everything which may offend them by the Callers to religion (Islam), wherever they may be and in any place they may dwell. Should any Christian woman be married to a Muslim, such marriage must not take place except after her consent, and she must not be prevented from going to her church for prayer. Their churches must be honored and they must not be withheld from building churches or repairing convents. They must not be forced to carry arms or stones; but the Muslims must protect them and defend them against others. It is positively incumbent upon every one of the follower of Islam not to contradict or disobey this oath until the Day of Resurrection and the end of the world.